The first game to use Nintendo's tilt technology. 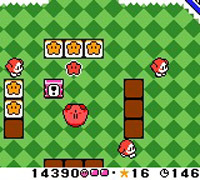 Kirby is on a top-down adventure, but he can only move from place to place by rolling. You control which way he rolls by tilting the Game Boy, and the further you tilt it in one direction, the faster he rolls. You can also flip the Game Boy like a paddle to make Kirby bounce into the air. Guide Kirby around the stages, hitting enemies and collecting stars to open the exit to the next stage. Beware of falling down holes in the ground or off the edges of stages. As well as the main game, there are several tilt-controlled minigames to play.